Ms K Nichols, Holly Pick, Abigail Monahan, Rotarian Mary Grant, and Lilly Smith. 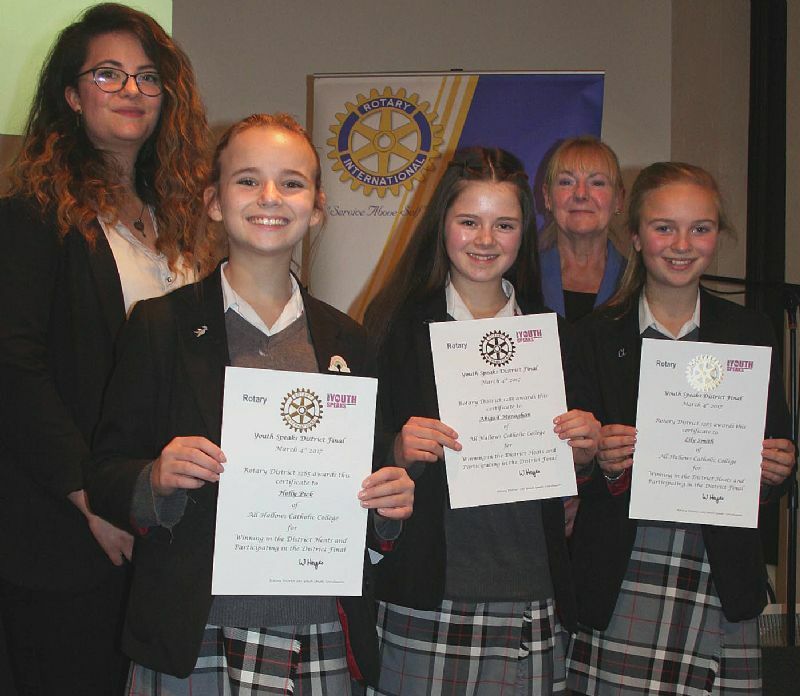 The Rotary District Final was held at Frodsham for the 10 successful winners of the Heat Competitions held for 62 teams earlier in the year across the North West. The individual award for Best Intermediate Chairperson was presented to Holly Pick from All Hallows Catholic College, Macclesfield whose team were sponsored in this competition by The Rotary Club of Macclesfield Castle. The team spoke on the theme of Peer Pressure and made a resounding impact on the audience with arguments detailing the challenges presented by Peer Pressure, raising awareness of the issues and additionally focussing on the positive aspects of social media. The team included Holly as Chairperson, Lily Smith as Speaker and Abigail Monaghan as Vote of Thanks. Rotarian Mary Grant said It has been a pleasure to work with and support the team and their teacher Ms Keara Nicholls. Keara and the team had given a great deal of time and effort to develop their presentation both in content and delivery. I am confident that in the future this team can win the overall Best Team Award in addition to individual awards.